Prosthetic limbs are becoming increasingly more lifelike, thanks to a host of developments in the field of robotics. 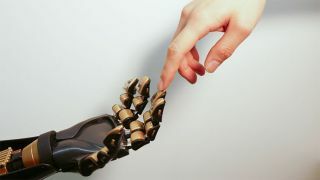 But now engineers at Stanford have taken a major step forward, by developing an artificial skin that can detect touch and send that information to living brain cells. It's the creation of Zhenan Bao, a chemical engineering professor, who has been working over the last decade to develop a material that can flex and heal like skin, but also has the capability to contain touch, temperature and pain sensors and relay that data to a brain. The latest prototype towards that goal can replicate one aspect of touch - it can tell the difference between a soft brush and a firm handshake, and send that info to the brain. "This is the first time a flexible, skin-like material has been able to detect pressure and also transmit a signal to a component of the nervous system," said Bao. To do so, it uses billions of carbon nanotubes scattered throughout a plastic indented with a waffle pattern. Pressure squeezes the walls of the waffle closer together, allowing them to better-conduct electricity. The greater the pressure, the stronger the signal. That data is then passed to the nervous system using a technique called optogenetics. Specific cells are made sensitive to light, and then light pulses can be used to switch those cells on and off, proving that the system can generate a sensory output that's compatible with our brain. It's hoped that, in time, the artificial skin could also distinguish texture and temperature. The human hand has six types of biological sensing mechanism, and pressure is just one of them. "We have a lot of work to take this from experimental to practical applications," Bao said. "But after spending many years in this work, I now see a clear path where we can take our artificial skin."